They were a very odd couple. In fact, every couple we know is odd, but that one showed it every chance they got. There were arguments, shouting matches. One day I watched her throwing clothes from the attic window while he bawled her out. The cause of the quarrel, soon known throughout the development (at Calders too, as well as Vista Alegre, where we specialize in local gossip), came down to the ivy. As if it could’ve been something else. I happened by when the ivy almost reached the road heading to the Font de les Tàpies. Not only was it beginning to spread everywhere, but at any given point the sheer bulk of the branches and leaves was considerable. It was exultant. There were days when the wind triggered a disquieting, hypnotic effect, and the waves of leaves rippled over the walls like a ship’s sails. Mosquito nets were draped over the house. You could see that it was filling with beetles and centipedes. Cinta wanted to prune the ivy, and Pere peeled the window sills and balconies. But he finally gave up, feeling as if his molars were being extracted instead of the ivy. It was summer, and his howls were heard coming from the house, obscenities of every kind. “We’ll see, won’t we?” replied Cinta. The ivy kept on growing till it reached the roof. In less than three years, it hid window frames and drain pipes, threatened the garage door, and wrapped around the corners of the walls. Even the balconies and the rain gutters on the roof were covered with a thick layer of leaves. The arguments thickened as well. And then something happened that must never have happened before. The ivy turned yellow, a sick, horrifying yellow. After four years of seeing it so luxuriant, to see it shriveled and burnt . . . “Look: now they’ve painted it the proper color,” said the neighbors. But it gave every appearance of being a bad omen, which was fulfilled a few days later. Cinta was found in the middle of the street. They—or rather Pere—had poisoned her with herbicide. The same herbicide that she intended to use on the ivy. He was sailing on tranquil seas when they put him, handcuffed, inside the police car. “I told her so” was the most repeated phrase at Vista Alegre in those days. The police cordoned off the house, which was left abandoned because the couple had no children and no one would buy it. The ivy recovered. It spent two years fighting off that ochre evil until it returned to its formerly exultant state. And not only did it recoup the space lost, but it covered the whole house. The whole shebang: windows, balconies, front door, even the garage door. The neighbors had to struggle against the stalks that the monster lowered into their gardens. They whined about the creatures nesting there, the wasps, bees, mosquitoes, and centipedes breeding underneath. But the ivy romped exultantly. I say the ivy because the house wasn’t to be seen anywhere. The shape alone served as a vague reminder that a building had once stood there. Till one day a construction company arrived. They had bought the house and needed to clean it. Six workers, three days, two truckloads of ivy. The façade was pallid, marked by the windswept ivy. To detach it, they also had to detach patches of the wall. It looked like the aftermath of a shrapnel attack. The trajectories sketched by the branches led your eye to the twisted drain pipes. The new owners laughed when they learned the history of the house. They weren’t apprehensive, they said, not in the least. When the ivy started to sprout everywhere again, they decided to build a pavement all around the house. With enormous slabs of stone. 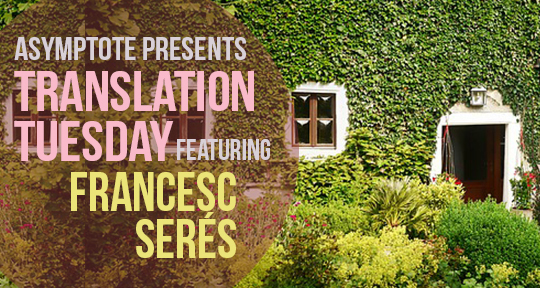 Francesc Serés is an award-winning Catalan author of novels, story collections, plays, and non-fiction. In 2013 MacLehose Press published an English version of Serés’s Russian Stories, which purports to be an anthology of non-existent Russian writers translated into Catalan. His narrative, The Skin of the Border, explores immigration to Catalonia. A regular contributor to the daily newspaper Ara, he lives in the northern town of Olot. Lawrence Venuti translates from Italian, French, and Catalan. He is the author of Translation Changes Everything (Routledge) and the translator of Ernest Farrés’s Edward Hopper: Poems (Carcanet). He recently won the translation prize of the Global Humanities Institute at Northwestern University for his version of J.V. Foix’s prose poems.